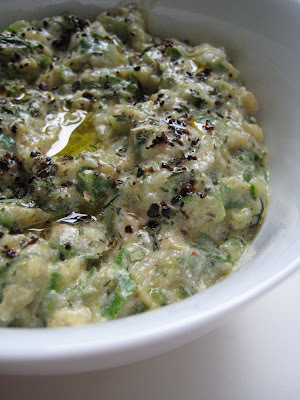 Although "the" fritter, or mücver in Turkish, dish in Turkish cuisine is the zucchini one (here's the recipe), variations are popular as well. Among the different versions of mücver, leek is the best, if you ask me. -Mix all the ingredients. If the batter is too runny, add more flour. -Heat oil in a frying pan on medium heat. -Drop scoops of batter in hot oil. Make sure they don't touch. -Fry them on each side until golden brown, 3-4 minutes. -when done, place fritters on paper towel to drain excessive oil. -Serve with plain yogurt or garlicy yogurt sauce. Hm, yum! I had leeks in my fridge that I didn't know how to use so I made this today and these fritters are absolutely delicious! I used some aged cheddar since I didn't have any feta. Thanks for posting this great recipe! Hi I like your blog and wanted to invite you to be part of a new directory www.recipebyday.com cooking blogs where you just have to register your blog and appear links to your recipes for you to visit. A greeting and thanks.